When it comes down to whom you should trust when you need to buy car insurance you can do no better than listening to this green reptile. Because as the world of jungle lizards are concerned these ones can do the most talking. Geckos are known to be talkative by chirping with its fellow species. So if you’re going to trust anyone when it comes to the safety of you and your car you might as well side with the guy who can actually do some talking. Plus it doesn’t hurt that his commercials are funny. 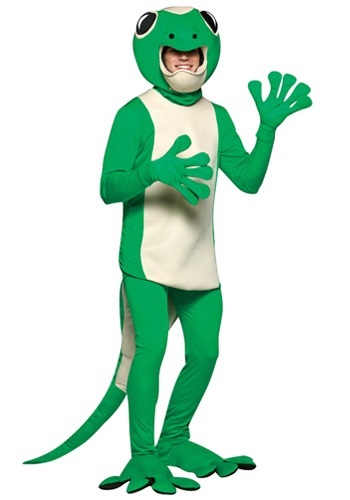 Look just like the Geico mascot from the commercials with this adult gecko costume. A great funny reptile costume for grown ups!